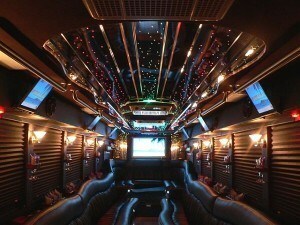 Limo party bus hire is inarguably the most thrilling way to get to a party with style. Rightly called “Party Bus”, it has enough space to comfortably accommodate 16 people at a time, still leaving enough space to walk around freely and even dance! With a lot of space for luggage, you can even take your friends out for an overnight personalized party time! The dazzling fibre-optic lights, built-in bar and CD player with surround system create a true feeling of a party night within the bus itself. If you are looking for a more peaceful environment, you can turn on the TV or simply relax in the cosy and comfortable leather seats while chatting away with your loved ones. The interior of the bus is designed to be highly flexible to accommodate your needs – you can create an energetic party atmosphere, or turn it into a peaceful and professional conference setting.The sofas cover all the sides of the party bus, making it perfect for family outing as well. Our professionally trained drivers will make sure that all your needs are served well along the way and that you arrive at your destination in time. The limo party bus hire is perfect for all outings, whether you are partying with a bunch of friends in town, or travelling to another place with your family or business partners. Contact us now for a free quote on 020 3475 2693!